This museum could take days to explore so we concentrated on some of the most prominent exhibits. Many sculptural reliefs were carved with side views of human subjects showing one eye and our guide reminded us of Homer's reference to cyclops (one-eyed monsters)in The Odyssey. Could his monsters have been inspired by sculptures like these? 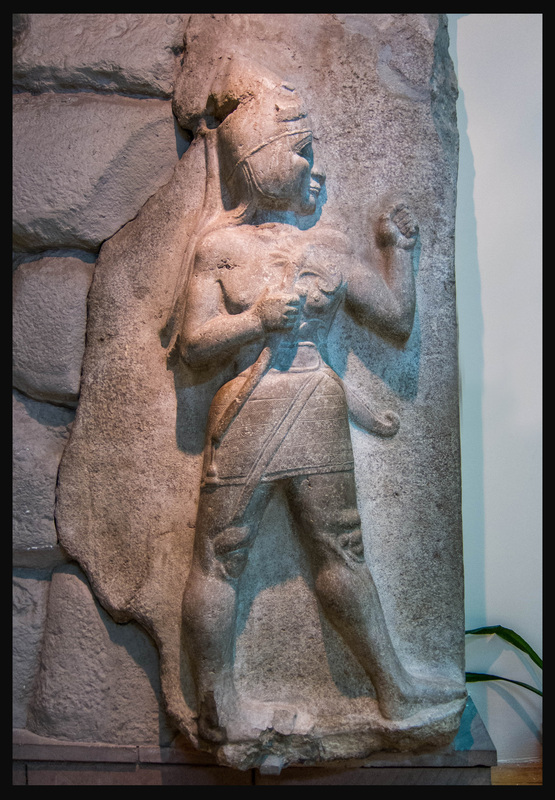 Turkey is an ancient land and we saw some of the oldest artifacts in this museum that I've ever seen before. One of the most important, in terms of age and culture, is the Mother Goddess, excavated from a site in the southern part of the country called Çatalhöyük (I had to look up the name - I asked Mert to say it and spell it more than once and STILL couldn't get it). This tiny sculpture dates back to around 7000 b.c. Hard to comprehend. 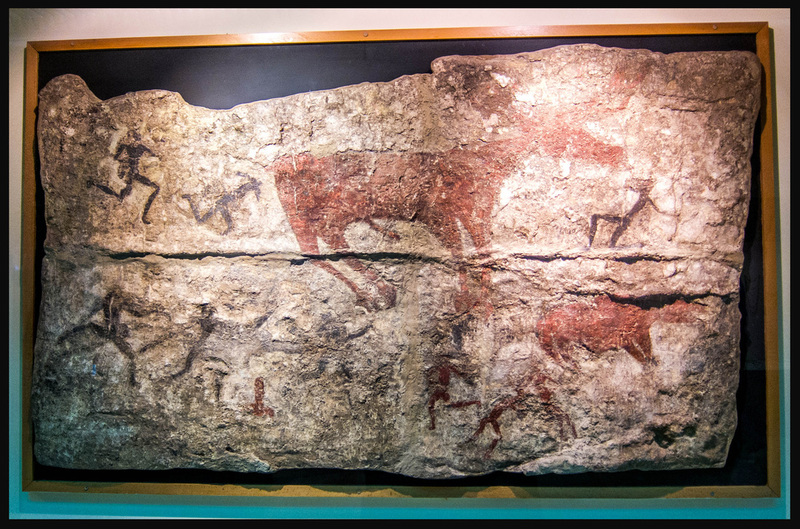 This hunting scene also dates from 7000 b.c. First word that comes to mind is 'Yikes'! 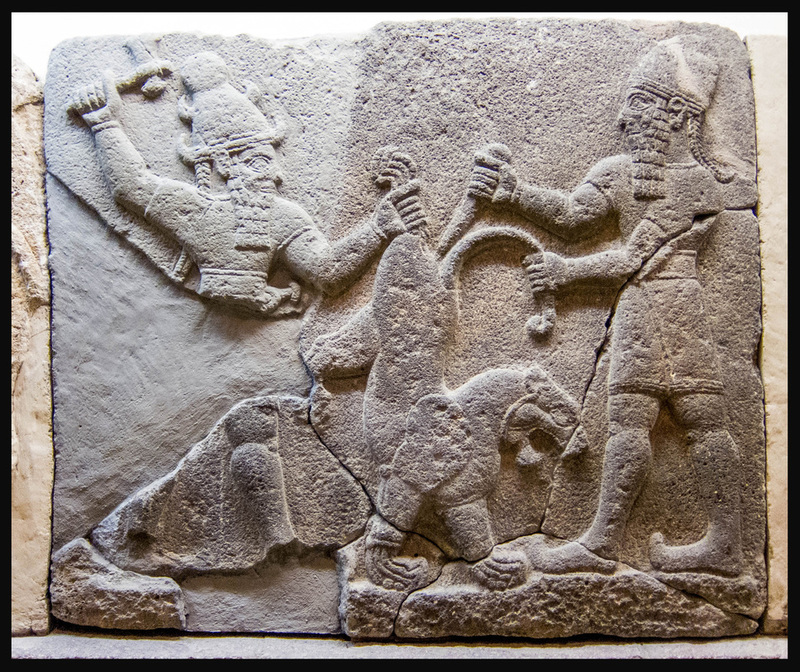 This hunting scene is brutal. 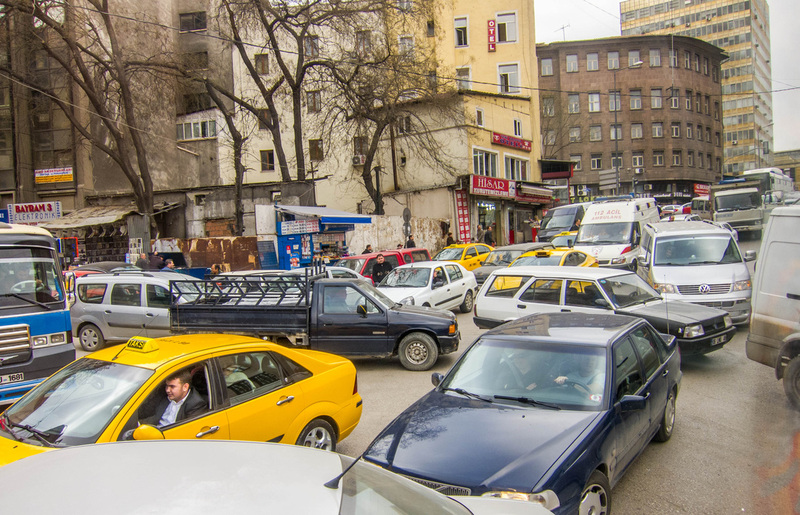 We eventually got extricated from all the cars and drove on to our next stop. One of the first things Mert told our group was that 'Turkish people don't just love Atatürk, they worship him!" 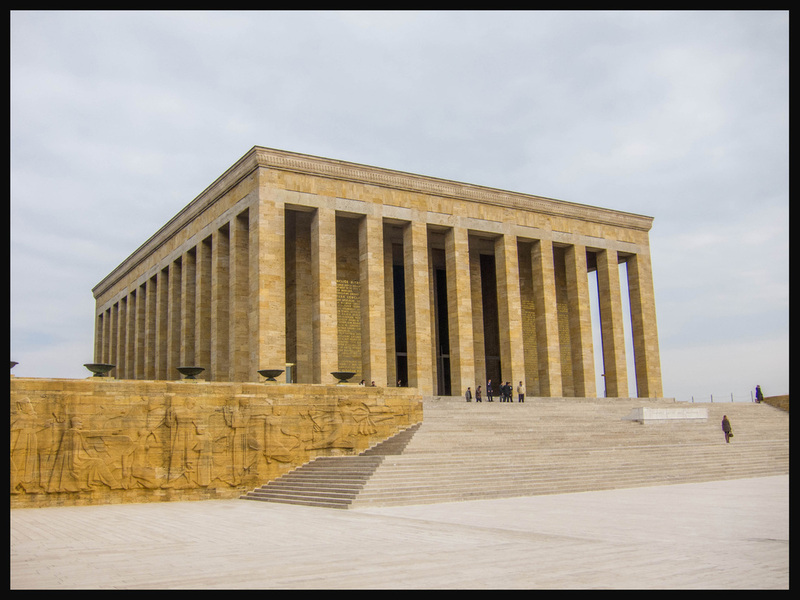 While I'd learned much on this trip already about Turkish history and the important part that Mustafa Kemal Atatürk played in forming what is today's Turkey, it was still a surprise to see this massive, yet beautiful, memorial. After some orientation, we were given free time to discover more about Atatürk for ourselves. 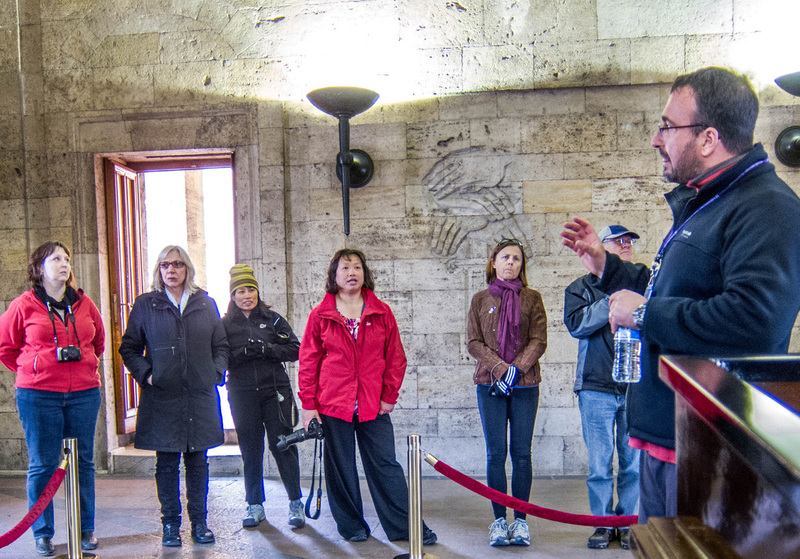 Fred and I went to the lower level where there's many photos detailing Atatürk's role in Turkey's history. We came away with new understanding and respect. 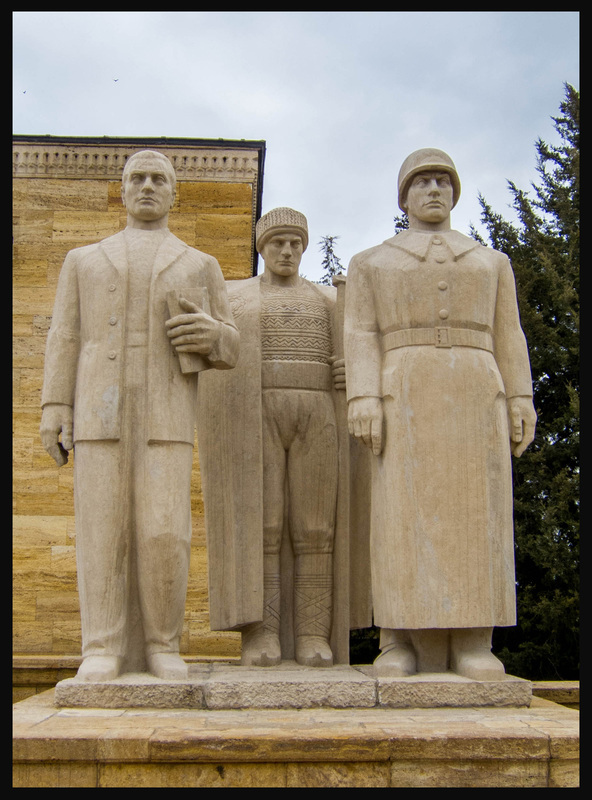 These statues represent the many roles of Atatürk in Turkey's history. Mert gave us a brief orientation before giving us time to roam on our own. Military guards stand at constant attention and truly don't move. The mausoleum is starkly beautiful and majestic in size - look at the people standing on the steps for perspective. 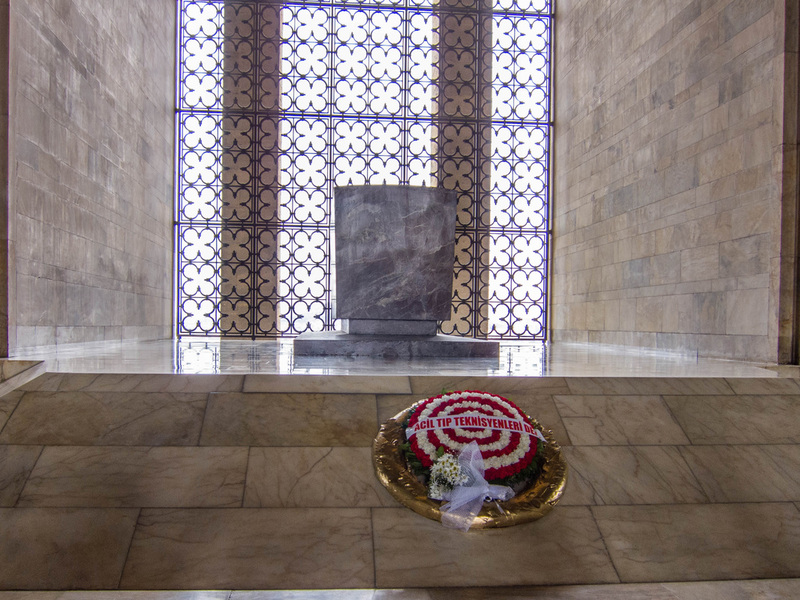 This may look like Atatürk's tomb, but it's really only a symbol of his true tomb which rests in the floor below in a special private room. We now had a few hours on the bus before reaching Cappadocia, but no problem. Our bus was modern with roomy and comfortable seating. We were never bored - our group had a great time visiting together. 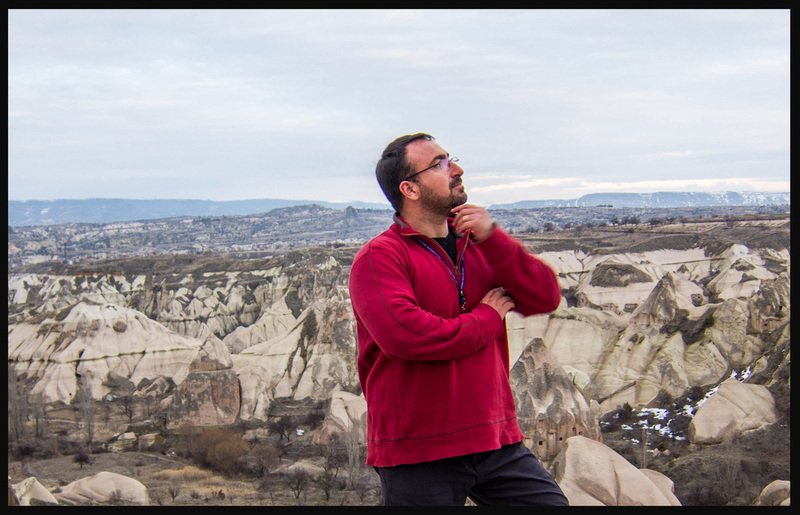 Also, Mert took our 'on the road' opportunities to give us more background on Turkey - sometimes its past, sometimes its present, but always fascinating and something that widened our understanding of the country and culture. 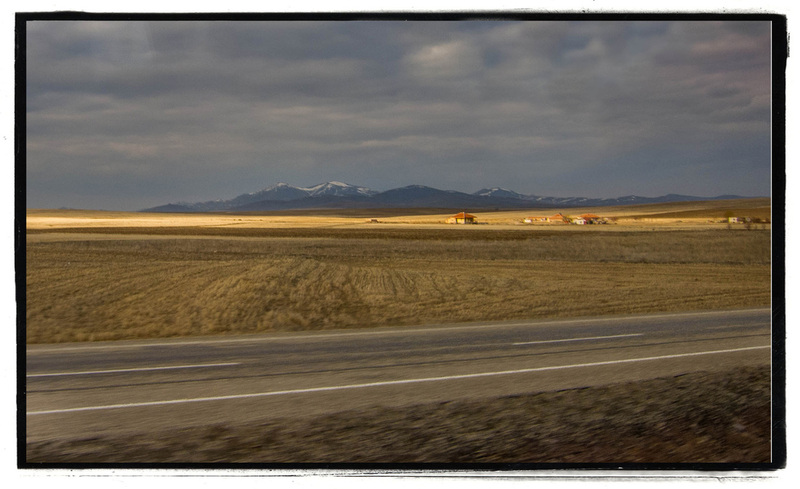 Outside the bus window, it was getting dark but there was a beautiful ray of light illuminating this field. Driving down the road in an area that still seemed to be countryside, our bus turned off into a parking area. 'This is it!' 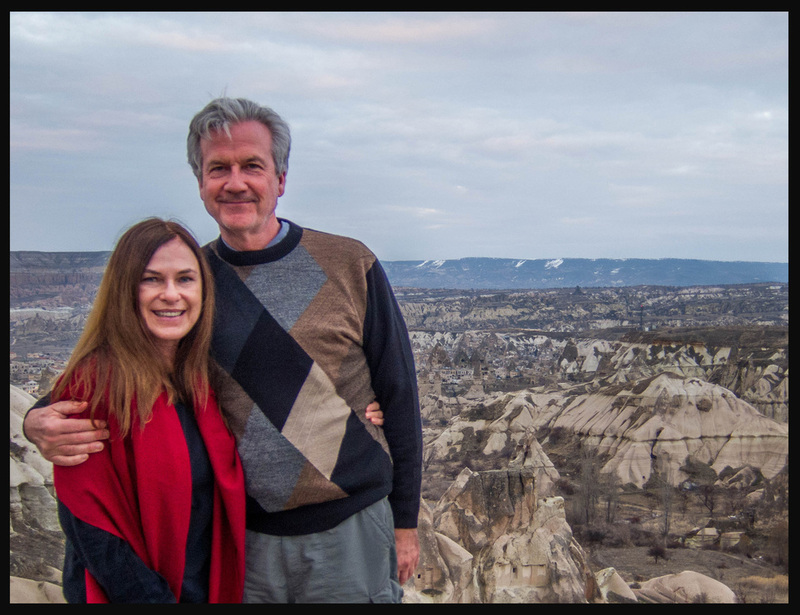 Mert said, 'our first glimpse of Cappadocia.' We couldn't figure it out until we stepped out of the bus. In front of us was a otherworldly setting - narrow peaks of pink, brown and gray stone jutting straight into the air. 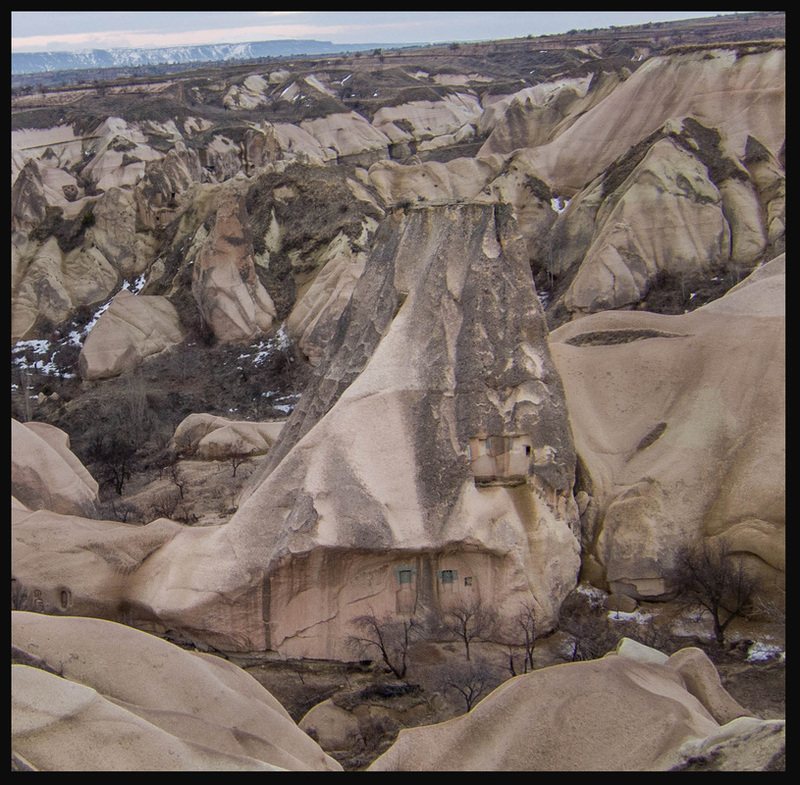 It was hard to believe that it was real, but this was Cappadocia. Here's a 'Fairy Chimney' house carved into the stone. We stayed in this wonderful place, the Old Greek House Hotel. We were all happy to reach our hotel in Müstafapaşa. 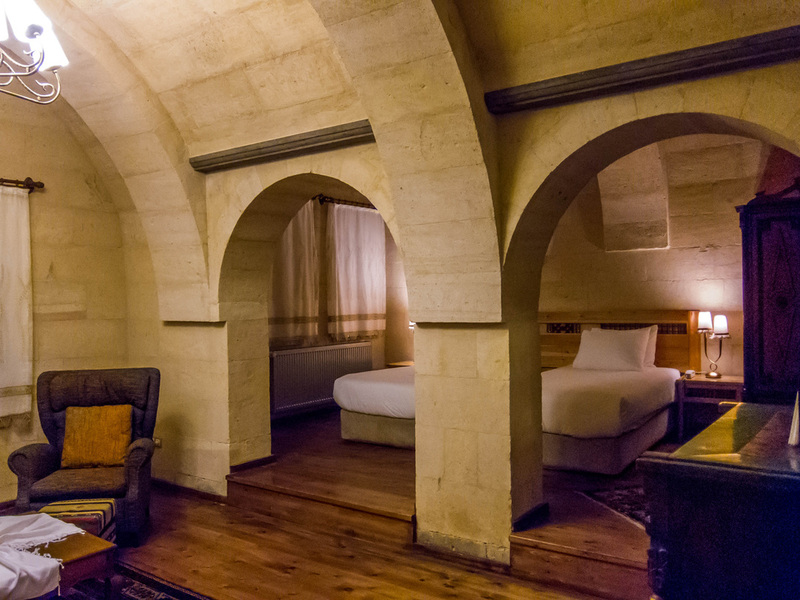 Part of the hotel and some of the rooms were caves that had been carved out of the hillside. ALL the rooms were great! Fred and I had a room in the newer section which wasn't a cave but had been built to create a similar wall texture. We had several delicious group dinners at the hotel in this building.